We now support recurring billing via PayFast! We always strive to make our processes simple and easy. This is why we are happy to let you know that we now support recurring billing via PayFast. This means no need to constantly log in an pay your invoices manually, saving you time! Normally when paying your invoices you would log into your client area, view your invoice you would like to pay and click view invoice. You would then see Pay Now button only. You will now see a subscribe button too. You will then be redirected to PayFast, allowing you to enter payment information. This information will be encrypted and stored at PayFast and an attempt to pay the current invoice will be made. Next time you have an invoice generated by us, we will request PayFast to automatically attempt to charge your last encrypted payment information on the date the invoice is due only. This feature also allows you to have single-click payments if the invoice has not been collected on yet. 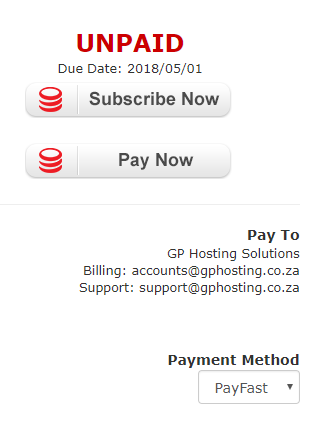 E.g Your invoice is generated on 25th April and it’s due date on the 1st May, but you would like to pay now, you just click Pay Now on the invoice. Our system then asks PayFast to charge your last encrypted information with them and attempts to pay the invoice. No redirects just a simple click and pay! You can also visit our knowledgebase article related to payment methods we accept. If you have any more questions, please feel free to send an email via our contact form. Click View My Invoices or click here. If you have forgotten your client zone password, please use the forgot password feature by clicking here. We look forward to continually providing you with the best possible service and value for money. Previous: Previous post: New Site Builder Product Launched!